Watterson Towers 315 S. Fell Ave.
Watterson Towers stands at 28 stories and is one of the tallest residence halls in the world. 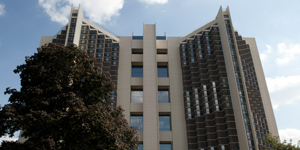 Watterson Towers opened in 1968 and was named after Arthur W. Watterson, a popular Professor of Geography from 1946–1966. He joined the geography faculty in 1946 and was chosen to head the department in 1951.